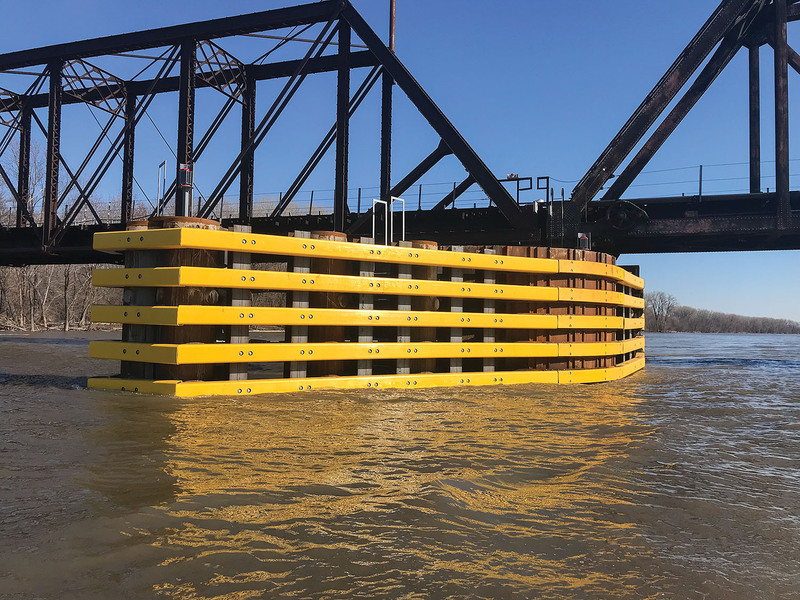 When the Upper Mississippi River navigation season begins, river traffic heading to and from St. Paul, Minn., will see a robust new protection system on the center pier of the Union Pacific railroad bridge near Pig’s Eye Island at the south end of the Port of St. Paul. The pier was destroyed on October 26, 2017, when a towboat pushing 12 loaded barges hit the swing bridge’s center support structure, causing the pier to split from the bridge’s truss. Union Pacific contracted J.F. Brennan Company Inc. to replace the old concrete pier, which was built in 1909, with a new structure of driven steel pipe. A year later, Brennan was contracted again, this time to build a protection system around the new pier. Starting last fall, the crew used over a million pounds of steel and 1,200 linear feet of composite timber to build a 160-foot-long guide fence to deflect barges from the pier. All the work was accomplished without interfering with river traffic. The outer fender was composed of three large sections secured on 12 piles driven 140 feet into the river bedrock. Brennan constructed two 25-foot-diameter dolphins, one upstream and one downstream, each filled with 850 tons of limestone rock and capped by a 5-foot-thick reinforced concrete slab. Eight steel bands were welded around each dolphin, and bright yellow composite timber was bolted on to form the protective fence. This spring, the crew completed minor components; the finished project stands ready to provide protection for the new pier when the first tow comes through. Project Manager Dan Gotz took pictures of the completed guide fence just before the river level rose 16 feet. It has been submerged and out of sight since then, he said. Brennan has an office, yard and marine slip at the Port of St. Paul’s Southport Terminal. 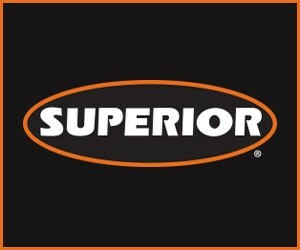 The company provides full-service marine construction at St. Paul, Minneapolis and at Savage on the Minnesota River, 15 miles upriver of its confluence with the Mississippi River. Brennan maintains a fleet of tugboats, cranes and barges, and performs bridge work, lock and dam maintenance and repair, and electric and hydraulic repair. The company’s diving services recently expanded to include underwater welding. “We’re getting a late start (on our navigation season) this year, because of high waters that closed several downstream locks and dams,” said Kathryn Sarnecki, vice president of redevelopment and harbor management at the St. Paul Port Authority. The port is the northernmost port on the Mississippi River. It extends from Upper Mississippi River Mile 839 in the north to Mile 833 in the south, in Pool 2 of the Mississippi River Navigation System, which has an authorized depth of 9 feet. “We’re hoping for the end of April,” she said, but with another storm predicted, the river may crest again, delaying the start even more. Lee Nelson, of the port’s harbor operator Upper River Services (URS), said that with locks closed due to high water almost to St. Louis, the earliest possible opening is seven to 10 days out. “We’re supposed to get eight to 18 inches of snow later this week,” he said on April 8, which will have an unknown effect on the river level. URS provides fleeting, cleaning and repair services on the Mississippi River between Red Wing and Minneapolis, and on the Minnesota River up to Savage. 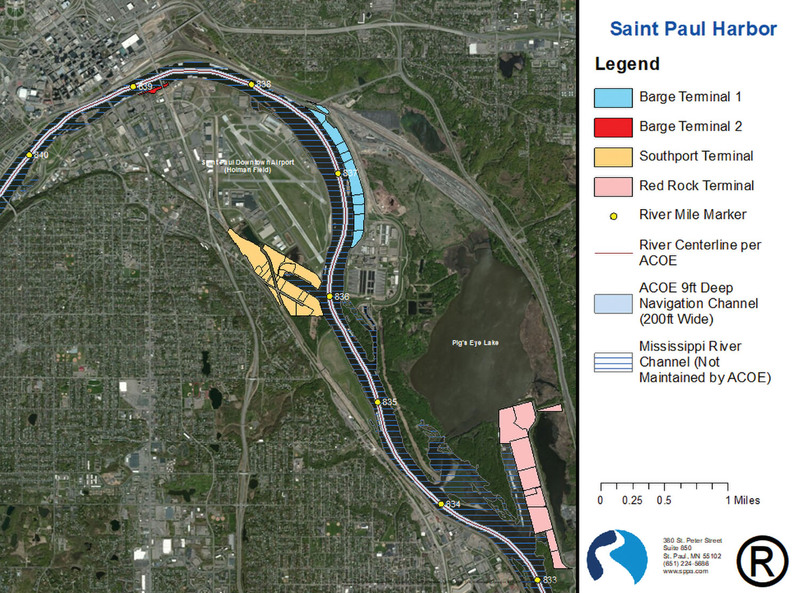 It maintains barge fleeting areas throughout the Port of St. Paul and at Savage. In the spring, Minnesota depends on deliveries of fertilizer for the agriculture industry and cement for road construction, and the delay could impact both those industries, said Sarnicki. Other major imports are coal, salt, sand and gravel. Corn and soybeans are the Nos. 1 and 2 exports, followed by feed and wheat. Distillers’ grains and scrap metal are also major exports. In 2018, the port handled approximately 7 million tons of cargo, mostly bulk commodities shipped by barge. Of this, 3.7 million was exports, and 3.3 million was imports. The harbor operator URS has the task of managing the thousands of barges that move through St. Paul in the course of the navigation season. URS breaks the tows upon arrival at St. Paul and delivers the barges to their destinations using its fleet of six towing vessels from 800 to 1,425 hp. After the barges have been unloaded, URS retrieves them and moves them to one of its two barge-cleaning facilities, where the covers are removed and stacked, and the barge interiors cleaned. URS maintains a number of fleets strategically located throughout the port for storing barges. 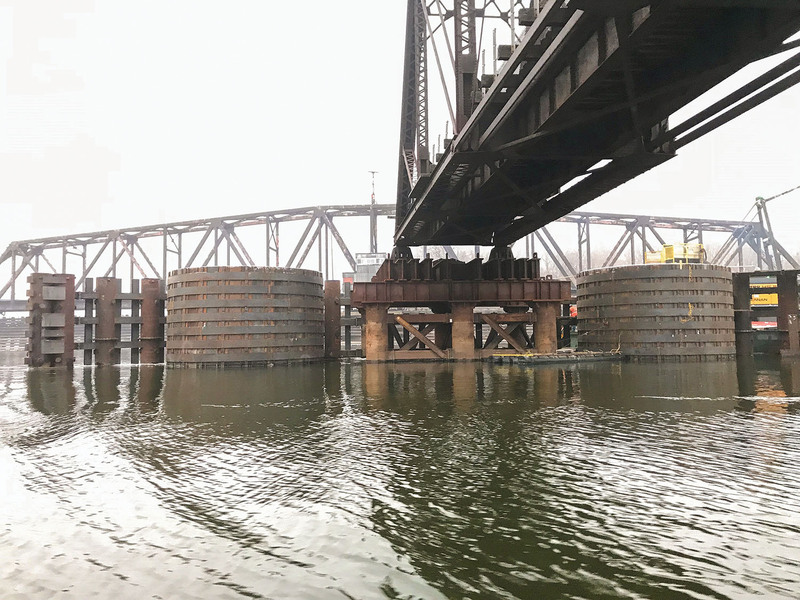 As well, it operates two full-service repair facilities at St. Paul Harbor, including a drydock that can pick up one end of a standard, jumbo-sized barge out of the water, in addition to smaller barges and recreational vessels. Its larger marine way can pull a jumbo-sized barge out of the water on a cart-and-rail system that allows as many as four barges to be moved inland for simultaneous repair. In addition, URS provides all other vessel repair and inspection needs to make the barges seaworthy and safe for their next trip downriver. The company acts as port operator for ports on the Mississippi from Redwing to St. Paul, as well as at Savage on the Minnesota River. The St. Paul Port Authority operates four publicly-owned terminals, and a number of privately-owned terminals are also situated along the river banks. Barge Terminal 1 is on the north side of the river at Mile 837. With 57 acres, it handles pig iron, salt, fertilizer, wood fiber, aggregate, scrap iron and steel, feed additives and petroleum coke. Barge Terminal 2 comprises 3 acres on the river’s south bank under the Lafayette Bridge. It houses the harbor operator’s headquarters and some of its maintenance and cleaning operations. Red Rock Terminal south of Pig’s Eye Lake includes 272 acres where inbound and outbound steel scrap, asphalt, grain, fertilizer and coal are handled. Southport Terminal, just south of the St. Paul Municipal Airport on the west bank, comprises 119 acres and handles recyclable metals and water treatment chemicals. The U.S. Army Corps of Engineers, the City of St. Paul Impound Lot and the Brennan headquarters building, yard and slip are also at Southport Terminal, along with other marine-based providers who lease slips from other tenants.